This is my beautiful boy shimma. I got him when he was about 3 months old. (When I named him I thought he was a girl because he was so young)When I bought Shimma from the pet shop I was not quite as knowledgeable about budgie health as I am now so I didn't realize how sick he was until I got him home and observed his lifeless behavior. 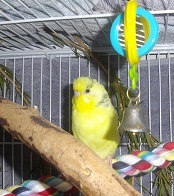 Shimma never sang or chirped, he never played with any toys or explored the cage and he didn't interact with my other budgie, instead he just sat in the corner barely eating. He also had lots of mucus dripping from his nose, a filthy vent and his feet were very scaly. I wasn't quite sure what to do, we lived hours away from a vet let alone an avian vet. All I could think of was to provide him with everything he needed, seed, clean water, cuttlefish, mineral block, fresh fruit, vege and grass seed etc. It took about 6 months but he finally fully recovered... Well almost. He still has some strange deformities like he has an iris ring in one eye but not the other and his cere is half blue half pink. But none the less he is now perfectly happy and healthy and is 5 and a half years old and still looking like he has a good amount of years to go. I really want to thank you for such an excellent site! It's absolutely brilliant! Thanks ever so much. Hi there, you certainly have taken good care of your boy. To get him healthy again must have taken commitment and love. As far as his remaining deformities go... not to worry. It is quite normal for a pied to have an iris ring in only one eye, and a cere that is only half coloured. This is caused by the same thing that removes the colour from some feathers.